HURON, S.D — July 1, 2017 — Starting from the front row, Shane Stewart grabbed the lead exiting Turn 2 on the opening lap and set sail setting a blistering pace. With the main event being cut short by one lap due to track conditions, Stewart had to withstand one final restart. On that restart with one lap to go, Stewart restarted directly in front of Schatz. The top two of Stewart and Schatz headed down the backstretch coming to the checkers. Schatz was able to get a run on the high side coming out of Turn 2 allowing him to drive by Stewart to pick up his 13th victory of the World of Outlaws Craftsman® Sprint Car Series season. 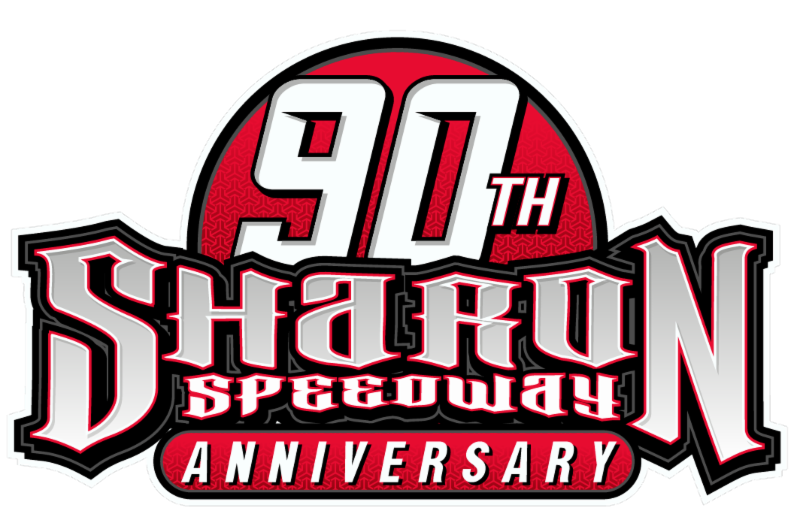 In a night that saw numerous flat tires throughout the 22-car field, the 30-lap race at Dakota State Fair Speedway was shortened to 29 laps due to track conditions. Shane Stewart, the driver of the No. 2 Larson Marks Racing entry has been on a hot streak over the last couple of week. Having won two-in-a-row at West Liberty and Beaver Dam, just a week ago, Stewart was looking to pick up his fifth win of the season at Dakota State Fair Speedway on Saturday night. After jumping out to an early lead on the start, Stewart set a blistering pace putting a gap between him and the No. 9 of Daryn Pittman who also started on the front row with Stewart. The first of six stoppages of the night was for the No. 93 who slowed at the top of Turn 1 with a flat tire. Sheldon Haudenschild would recover for a fifth-place finish. Stewart would jump back out to a big lead on the restart. Schatz who was running third behind Pittman at the time was able to get by the No. 9 Great Clips machine on lap 22 for second. It was on lap 25 that Pittman sustained a flat tire, bringing out a yellow flag. As the field was coming to get two laps to go at the stripe, Schatz dove aggressively under Stewart for the lead in Turn 3 and made it stick. However, the No. 5 of David Gravel went for a flip in Turn 1 at the same time, giving Stewart the lead back for the restart, Gravel was able to be pushed to the work area but could not return. Due to track conditions, officials made the decision to the shorten the race by one lap. Stewart regained the lead after the previous lap was not scored complete. Stewart lead Schatz, Kaeding and the rest of the field to the restart where both the green and white flags were displayed. Stewart led into Turn 1 but Schatz used the top grove exiting Turn 2 to get by Stewart for the lead. 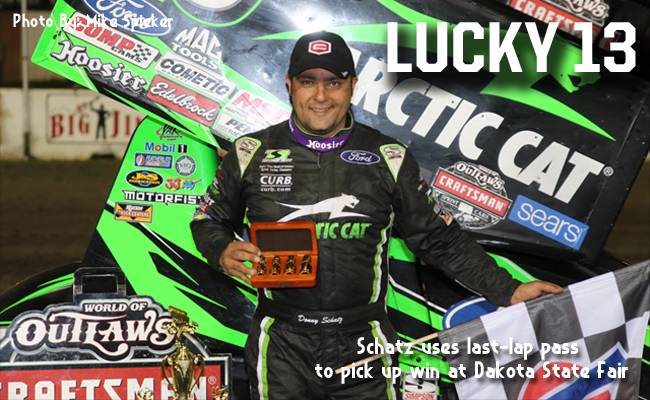 “I’m here to win races, that’s what we’re here to do,” said Schatz regarding his winning pass. “When you’re in second and got an opportunity to win a race, that’s what you’re going to do – you’re going to go for it. You’re not going to do anything silly and we didn’t. We got the win and that’s what matters,” added Schatz. Schatz would complete the rest of the 3/8th-mile en-route to his 13th victory of the 2017 World of Outlaws Craftsman Sprint Car season. “We definitely got our monies worth on the tires tonight,” said Donny Schatz who’s right-rear tire was bald. Stewart would eventually lose another position to Tim Kaeding in the No. 3 who took advantage of others misfortunes and drove up through the field from the 12th-starting spot. The World of Outlaws Craftsman Sprint Car Series returns to action on Thursday, July 6 for a make-up Feature at Deer Creek Speedway in Spring Valley, MN before heading off to Cedar Lake Speedway in New Richmond, WI on Saturday and Sunday, July 7 and 8. Tickets for these events can be purchased on WorldofOutlaws.com/Tickets or by calling 844-DIRT-TIX.